1941 Enlisted in the Navy. Robert wanted to skip school with his buddy and join the Navy but his buddy backed up and Robert told his father he was going to enlist anyway. 1942 The battleship Pennsylvania had 14” guns and one had to button up or the your chest would feel like someone stomping on it. The ship would actually roll when all 12 guns would go off at the same time. 1942 Robert would spend a lot of time of his duty in the pump rooms and ammunition supply area. 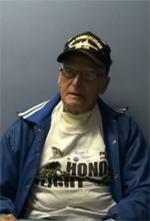 10/25/1944 Robert was part of the last “crossing of the T” in naval warfare during the Battle of Leyte Gulf. When the Pennsylvania and five other battleships crossed the Japanese fleet and eliminated them. This was also the last engagement of battleship versus battleship in history. 1945 Robert Packer was in every single invasion of the Pacific except for Okinawa and Iwo Jima. 3/1945 USS Pennsylvania left the Marshall Islands for Pearl Harbor to San Francisco arriving to undergo an overhaul. Robert went to Charleston, South Carolina to board a Destroyer for a 90 day wonder. Then went to California from Pensacola to board an aircraft carrier. 6/1950 Robert signed up for the reserves and it was not very long before he was called up for Korean War server on the aircraft carrier CVE-117.